SpaceX Rocket And Its Cargo Explode On Launch Pad In Florida [VIDEO] : The Two-Way A "significant explosion" hit the SpaceX launch pad at Cape Canaveral early Thursday, destroying the unmanned rocket that was set to launch this weekend. Smoke rises from a SpaceX launch site at Cape Canaveral, Fla., on Thursday. 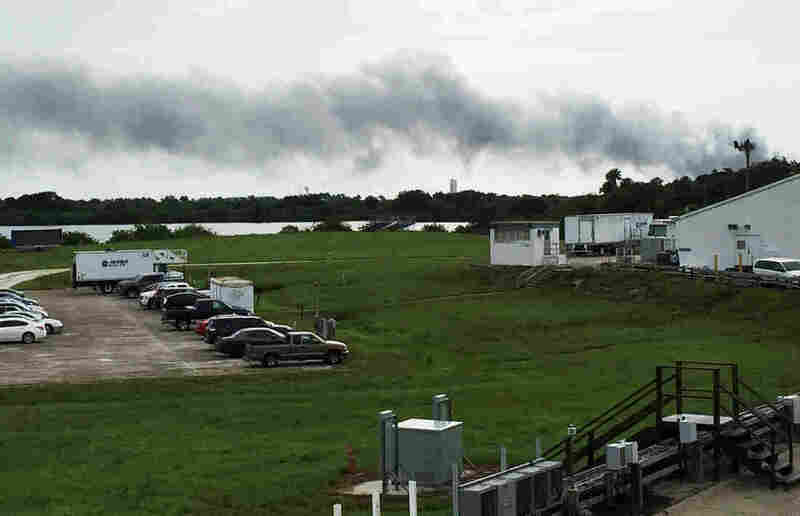 NASA said SpaceX was conducting a test firing of its unmanned rocket when a blast occurred. Two days before SpaceX was to launch a communications satellite that would widen Internet access in Africa, an unmanned rocket and its payload were destroyed in an explosion on a launch pad in Cape Canaveral, Fla. Smoke billowed from the pad where the AMOS-6 satellite was to be launched Saturday morning. A "significant explosion" hit the launch area early Thursday, the 45th Space Wing at Cape Canaveral Air Station tells member station WMFE's Brendan Byrne. It said no casualties were reported and that there was no threat to the public's safety. SpaceX says "an anomaly on the pad" caused the explosion. Disaster struck as workers at the launch pad prepared for a test firing of the rocket. The explosion occurred as the rocket was being filled with propellant, says SpaceX founder Elon Musk, who adds in a tweet that the blast originated near the upper stage oxygen tank. You can see the blast for yourself, thanks to a veterans group that had a camera trained on the space vehicle this morning. The explosion comes shortly after the 1:10 mark. The launch, which had been planned for 3 a.m. ET Saturday, was significant for a number of reasons. The payload included a communications satellite meant to provide direct Internet access to large and remote swaths of sub-Saharan Africa, in a program led by Facebook that also includes Eutelsat and Spacecom, the Israeli company that made the AMOS-6 satellite. After the loss of the rocket and its payload, Facebook founder Mark Zuckerberg posted an update from Africa to say he is "deeply disappointed to hear that SpaceX's launch failure destroyed our satellite that would have provided connectivity to so many entrepreneurs and everyone else across the continent." Zuckerberg added that his company has other technologies in the works, "and we will keep working until everyone has the opportunities this satellite would have provided." The explosion follows a run of recent successes for SpaceX, including landing part of its Falcon 9 rocket on a floating barge as another stage continued into space. But there have been setbacks — including a rocket that exploded as it attempted to land on a barge in January, and another rocket that blew up shortly after takeoff last summer. This is a breaking news story, and we'll update this post with reliable information as it emerges. For a brief period, this story stated that the exploded rocket was the first one to be reused by SpaceX. In fact, the first mission that will rely on a previously used rocket is slated for launch later this year, as was recently announced.